The jumper is navy but the contrast is actually not good enough to show the right colour. Socks are raspberry (kind of a bright raspberry colour). 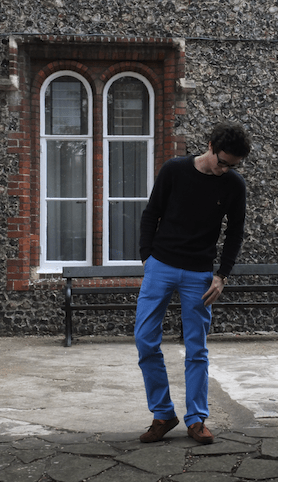 The chino is a petrol blue- which matches the navy jumper perfectly. The car shoes in caramel, are from Bobbies- a French brand established in Paris. I have worked for them in Toulouse as a salesman. I did it great, I made some sales, if you travel down to Toulouse, you’ll remember my post! By the way the socks are handmade in France.- they have plenty of colours available on their website.